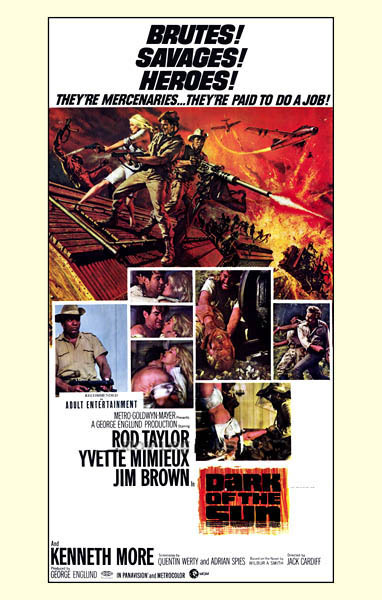 DARK OF THE SUN (British)(1968): 101 min Starring: Rod Taylor, Yvette Mimieux, Jim Brown. Rod Taylor plays Capt. 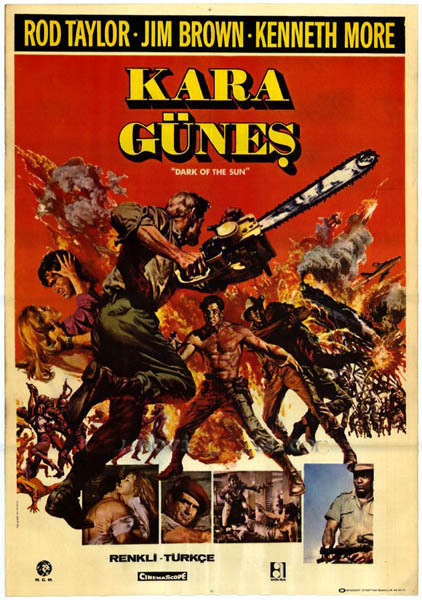 Bruce Curry, a hardboiled mercenary leader in this raw, gritty action flick directed by Jack Cardiff. The film, which depicts the blood-soaked war in the Congo in the 1960s, maintains a steamy, edgy feel throughout while exploring the morality and motivations of the mercenaries. Taylor's intense Capt. Curry is a veteran soldier-of-fortune hired by the president of the Congo for a three-day mission: Curry and his partner, native Congoan Ruffo (Jim Brown), are to lead a train through the war-torn nation to rescue a besieged community. The mercenaries also have a clandestine objective: Bring back a load of diamonds to support the new president's regime. With the help of 40 of the Congo's best soldiers, a Nazi sympathizer (Peter Carsten) and a drunken medic (Kenneth More), Curry and Ruffo set off on an odyssey, constantly facing the threat of attack by vicious rebels. Along the way, they save a beautiful missionary (Yvette Mimieux -- Taylor's "Time Machine" co-star), who softens Curry's hard edges.